Rudridge Gravesend has welcomed five new lorries to its delivery fleet following investment in five 32-tonne Mercedes-Benz Arocs 3240 Tridem 8×4 lorries. Reportedly one of the only companies of its type to provide a next day delivery service to its customers, the grab loaders will feature improved manoeuvrability meaning they will be easier to handle in areas with restricted access, such as building sites. 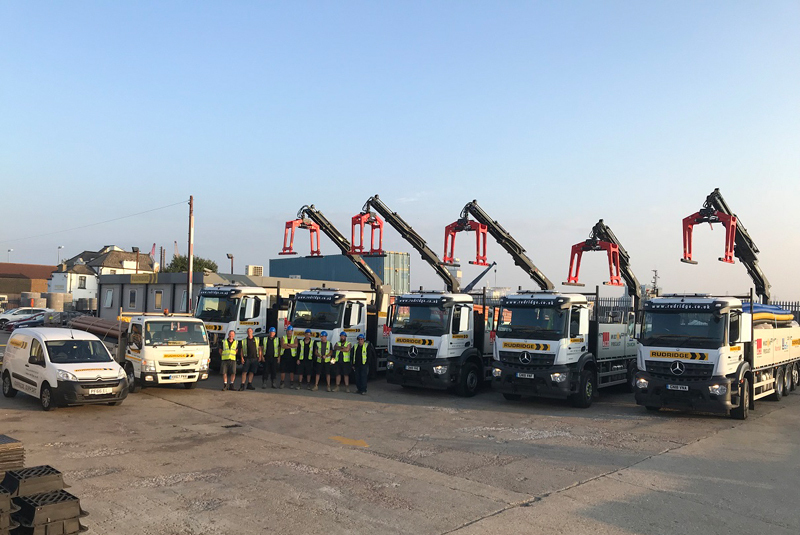 Each lorry is capable of a carrying capacity of 17 tonnes and has a HIAB X HiDuo 188 B-2 remote control crane which has been specifically chosen to handle the civils materials supplied by Rudridge. The lorries will operate alongside the branch’s existing vehicles which include a 7.5 tonne Mercedes Canter and a Citroen van.